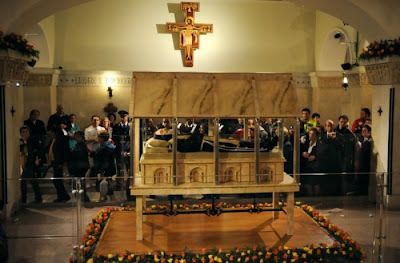 Unam Sanctam Catholicam: Padre Pio Incorrupt? One thing I wonder about with these modern alleged incorrputibles is that they often have been treated with modern embalming techniques, making it difficult to draw the line between natural preservation and miraculous incorruptibility, like the nonsense with Pope John XXIII being incorrupt when everybody who knows about the case acknowledges that his preservation is due to natural processes. 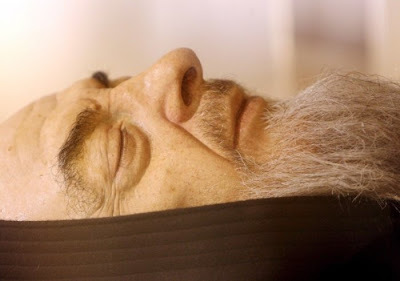 Further complicating the issue is this fact: when Padre Pio was exhumed, the face was covered with a life-like silicone mask to make it viewable to the public. This mask is meant to lay over the skull and create the appearance of flesh and allow otherwise decomposed corpses to be more acceptable for public viewing. When the tomb was first opened, papal legate Archbishop Domenico D'Amrbosio said, ''As soon as we got inside the tomb we could clearly make out the beard. The top part of the skull is partly skeletal but the chin is perfect and the rest of the body is well preserved" (source). What he means by "the top part of the skull is partly skeletal" I do not know, but it is clear that the face was a little less well preserved than the pics above would lead us to believe. Since his face has been covered by a silicone mask made to resemble flesh, we do not really know to what level of decomposition this corpse has reached. Now please do not accuse me denying Padre Pio's sanctity! I have had reservations about some modern canonizations and beatifications: I question the attempts to canonize Mother Teresa and John Paul II, (here and here) for various reasons. But I have no reservations about the sanctity and miraculous works of St. Padre Pio. 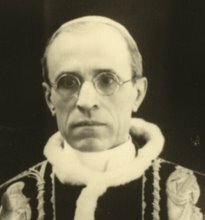 Interesting from a Traditionalist viewpoint is that he requested and obtained permission from Paul VI to continue using the 1962 Missal after Vatican II. It was widely rumored after the Council that Padre Pio had met Archbishop Marcel Lefebvre, and that the saint had prophetically warned the Archbishop that he would "tear apart the community of faithful." This nonsense has since been debunked, and Archbishop Lefebvre formally repudiated it before he died (see here). I love Padre Pio, and I am not in any way saying that he is not saintly, or even that he is not incorrupt. What I am saying is this: because of the silicone mask and the formaldehyde treatments, nobody can be sure now. The waters have been muddied, and room is opening up for the possibility of doubt. Anybody who sees this can say, "Yeah, but they embalmed him, sealed him in an airtight tomb and put a silicone lining over his face when they exhumed him." True. 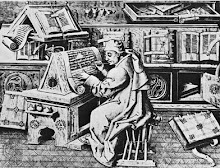 The case for true incorruptibility is now more difficult to discern. What we need in these times, especially when it comes to persons of eminent sanctity like St.. Pio, is clear-cut truth, not more uncertainty. 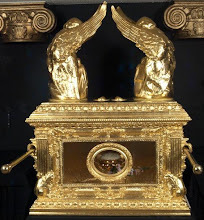 I say that whenever a person dies "in the odor of sanctity," they ought to be buried (a) without any embalming at all, as most saints throughout history have been, (b) in a simple wooden coffin. These are the conditions in which St. Francis Xavier was buried in Goa, India in 1552, and his body remains incorrupt after 456 years and being subject to the intense heat and moisture of the Indian climate. That is a miracle that there can be no doubt about. But as for Padre Pio, holy as he is, we will never be able to know for sure. Thanks for checking out this blog - if this is your first time here, and if you enjoyed this post, check out some of my favorite posts here. Also, be sure to scroll down the side-bar for other favorite posts.You can also follow us on Facebook - if you are logged in, click here to join our Facebook page! Actually they used a mask. "The friars had said the body was in "fair condition," although the skull and parts of the upper body showed serious signs of decay. The archbishop and the Capuchins hired Gems Studio, the London-based firm that makes figures for Madame Tussaud's Wax Museum, to create a silicone mask -- including a short moustache and ample beard -- for the body." 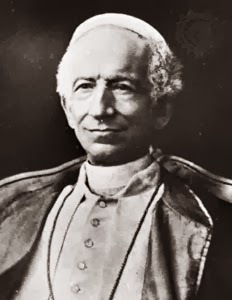 "I have had reservations about some modern canonizations and beatifications: I do not think either Mother Teresa nor John Paul II ought to be canonized, for various reasons"
Would you be so kind as to expound on those reasons? Yes, I will share my reasons. 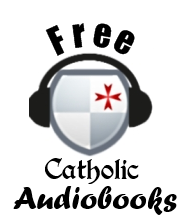 I also suggest this bloggers other articles on JPII, which go over the many reasons why JPII's public actions were often times bad for the Church. As to JPII, I feel his real contribution to the Church will come in the future through his writings, and not his actions during lifetime. There is great amount of wisdom in those many writings for others to ponder. Thus I agree with the premise that his canonization is not (should not be) just an automatic thing. And I think if it happened under B16, that would tarnish it all. After much reflection (100 years or more), it could happen. For now, I do see less and less mention of JPII the Great. The title only comes from the masses, not the Church. And I feel that JPII The Pretty Good is enough for now. Now, Mother Theresa is another story. She is the epitome of Catholic Action. She was all about living the faith. And if nothing else I hope to always remember that with every new person she met, she first looked for Jesus in that person. She understood He was there, somewhere. I think she would humbly reject the declaration/attention of sainthood from the Church on earth. She already has it, and we all know it. you really come across as a nut. A nut for believing in incorruptibility or a nut for questioning Padre Pio's particular incorruptibility? Honestly, i believe the preservation of bodies on public display is a sick thing. These men and women were heroes in their times. They deserve better than to have masses of people treat their corpses as a tourist attraction. Thank you for having the courage to tell the truth, Boniface. 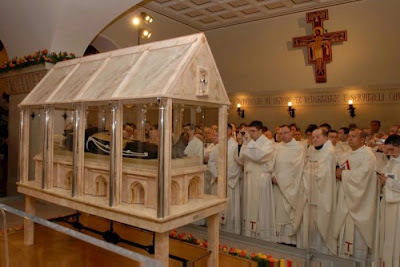 I, too, am troubled by the presentation of St. Pio's body, while at the same time I rejoice in his sanctity. Among other reasons, Our Lord gave us St. Pio to confirm the reality of supernatural in a time of naturalism and modernism. I think it is somewhat troubling that those of us who only read what is "reported" and have no inside information want to pass judgement. As for Pope John Paul II and Mother Theresa...the two are not canonied as saints so speculations and judgements on your behalf would not only seem to be ill advised but jumping the gun a bit. 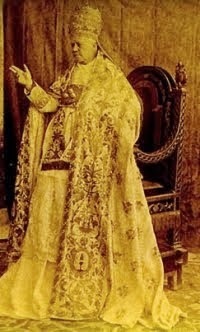 As for your comment about Pope John Paul the Great not contributing...perhaps you are unaware of Theology of the Body. To look at that series of documents is to KNOW that God is present. It is to know Gods' divine Plan...and I don't know that God would give it to a flipant pope who was a relativist...especially because he was anything but a relativist. In addition, I think it important that we understand that the Church does things on Her schedule...not ours. Had it not been for Pope John Paul the Great, much of what Pope Benedict XVI has done would not have been possible. In addition, we must draw in the masses with love, not pointed swords toward their belief...I think your commentary would have been relavent 9 centuries ago but is out of date today. 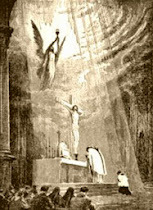 As for St. Padre Pio, the main reason for his public display has NOTHING to do with whether or not he is incorruptible. It is the physical shell of who he is that counts in this instance and every instance of saints that are displayed. To have the person of him that proves his physical existence is what truly is important. Think about it, this is the very reason that knuckleheads go around saying Jesus never existed or that he was made up, despite historical evidence that was critical of his person and teachings (jewish historians and roman historians). When did I say he didn't contribute anything? Theology of the Body is a different story, and I do think people are exaggerating its importance a bit...but what am I jumping the gun with? Again, jumping the gun on what? We can't have an opinion on whether or not one should be canonized until after they are canonized? By then its too late for discussion. 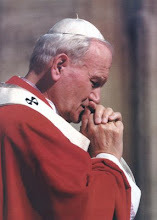 John Paul II had Cardinal Ratzinger, then head of the Holy Office, write a document that told the Jews that Jesus was not their Messiah and that they were 'ok' to wait for another; and said that it would be the first coming for them of the Messiah, and the second for Christians, and that it would be a 'being with only traits or traces of the first Jesus that came.' This is a deliberate attempt to lead the flock to endorse Antichrist as the 'second coming.' It is not 'nutty' to question the 'sanctity' of post V2 revolutionaries who promote judaeo/masonic syncretism under the name of Catholicism. I submit too that Ratzinger/now Benedict XVI's endorsement of reading the Talmud, a satanic tome which calls Our Blessed Mother "Miriam the Whore" and which says Our Lord is in hell in 'burning excrement' are hardly examples of real popes. People who can't face the Great apostasy of Vatican 2 like to call sedevacantists 'schismatics' while saying EVERYONE else is SAVED, including atheists and all other unbelievers and pagans. This is ridiculous. Our Lord Himself attested to the LACK of faith when He returns - Think you, the Son of Man, when He returns, will find faith left on earth? This necessarily presupposes the Catholics en masse have apostasized. I give to you the spectacle of praying with pagans and non believers - thus contradicting St. Paul's own words that the gods of the pagans are DEVILS. This is straight out of the playbook of Alaistair Crowley and people of his ilk in the masonic lodge - Mdme Blavatsky and her theosophical crowd etc. The novus ordo missae, written by two Christ hating rabbis and six prot ministers who believe NOT in transubstantiation, and a thirty third degree mason by the name of Bugnini who later went out and committed suicide by hanging (shades of Judas) closely resembles the Gnostic 'mass' written by Charles Webster Leadbetter in his 1921 Science of the Sacraments. Fr. E Sylvester Berry in his Apocalypse of St. John says the false prophet will replace the Catholic sacraments with invalid substitutes that resemble the old ones but lack grace to bring on the apostasy. Hello Paul 6. Have the guts to post my comment. 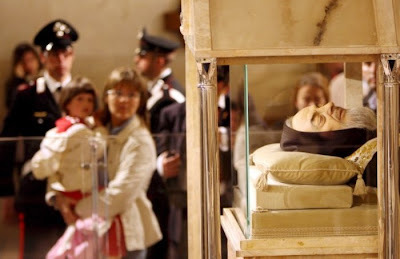 the bishops and everyone who was around at the time of where Padre Pio's body was exhumed has explained clearly that the upper part of the skull is slightly corrupted, but the rest of the body is in a fair condition. so i dont think there is any issue about it. And secondly, if you think that the body is uncorupted in reason for the embalm , and cause it was in a sealed cell , then what about now ? it is still in a very good condition even when the body is lying under a glass box. If you have no faith and respect toward catholicsm and St Padre Pio i think you should just keep your mouth shut, without trying to show your nobleness by posting such sinful documents. "I love Padre Pio, and I am not in any way saying that he is not saintly, or even that he is not incorrupt. What I am saying is this: because of the silicone mask and the formaldehyde treatments, nobody can be sure now. The waters have been muddied, and room is opening up for the possibility of doubt. Anybody who sees this can say, "Yeah, but they embalmed him, sealed him in an airtight tomb and put a silicone lining over his face when they exhumed him." True. The case for true incorruptibility is now more difficult to discern." If someone is claimed to be incorruptible, we had better be certain before allowing people to believe so, otherwise they could have their faith damaged when they find out that this is NOT his real face - that he is covered by a silicone mask, or that he has been embalmed. Certainly you should not say that to discuss these issues is "sinful." Perhaps Padre Pio himself didn't like that mask they put on his face. I saw Padre Pio celebrating Mass when I was a child living in Italy in the early '60's. It was a freezing cold morning and it seemed that we had driven in the dark for hours to the top of a lonely hilltop village. My brother and I recently recalled that our greatest disappointment was that his hands were covered with gloves and we couldn't see the 'stigmata'. 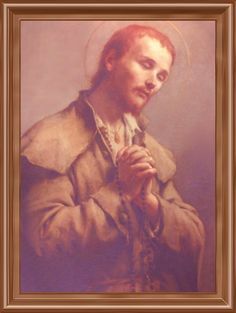 None of us remain Catholic today, but I still feel a special connection to this man. *no offence, just came here to show my opinion for the subject. you are right in that if a saint is embalmed, covered in wax or otherwise preserved, it makes it much more difficult to discern their incorruptibility. 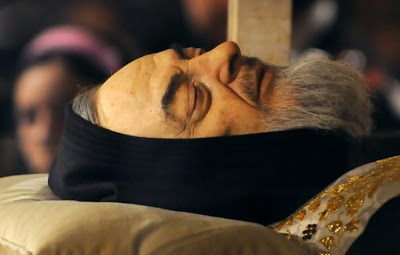 I do not say Padre Pio is not incorrupt, only that it is hard to say. I do think you are giving too strict a definition of incorruptibility...Catholics have never stated that incorruptibility necessitates a perfect condition; rather, only that the body is in a remarkable state of preservation relative to its age. A good example is St. Francis Xavier, died in the 1500's. He is a little shriveled, skin is darkened and body mass is deteriorated a little, so he is not in perfect condition by any means. but he still has the hair on his beard and head and a considerable amount of body mass - this is remarkable, considering he was buried in India in a simple wooden coffin and under those circumstances most bodies turn to bones in a matter of 5 years and he is pushing 5 centuries. so, the bodies need not be perfect, only preserved far beyond what would be expected. Here's an article that says they unearthed Padre Pio on May 2, 1999, and he was NOT there. I believe this body is a fake. Actually I agree. As a convert to me the viewing of a saints body always created me out a little. Not the process of checking for incorruptibility but putting remains out there as a tourist attraction. When I found out St Padre Pio wasn't really incorrupt it crushed me, I have seen many sources say that he is. My priest thought he is and I had to inform a good friend as well, they didn't know it was a mask even after seeing his body themselves. 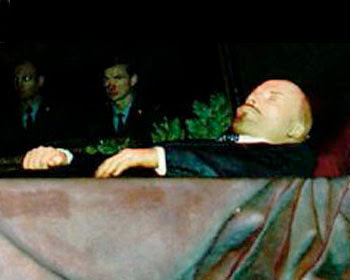 It seems that his body is a major money maker so the truth is obscured even at his resting place! Katharine, yes that is why people should have just been truthful upfront rather than spreading misinformation that is devastating to faith. Similar, or perhaps even more, touch-ups were done on the body of St Bernadette Soubirous, I think. To Find the body after 30 or more years barely rotted is extraordinary. Take St. Francis Xavier his body was found incorruptible but someone put quick lime on him to speed decay. That's why his face looks partially burnt. Having spent a nice few days in San Giovanni Rotunda and viewed the body of Padre Pio I can confirm that he is not incorrupt. His habit and shoes cover all of his body bar his face and hands. His face looks fresh but I believe what I am looking at is a complete silicon mask. His joined hands have decayed quite considerably and appear as black strands of straw. I had hoped to see an incorrupt body so was disappointed for myself. If the body is sacred, why do we put it on display. It seems out of respect and propriety we should bury them. Not put them on display like a side show. also look up about the first time the body was exhumed. No body was present. This story has been suppressed. Do some research.... you may come across something.